Price difference between basic VoIP phone models and models with BLF keys is usually quite significant. Separate side carts are also pretty expensive, especially considering that involved hardware is quite simple. While few side carts can be usually chained together for total of ~100 lamps, these configurations not always work according to manufacturer claims. 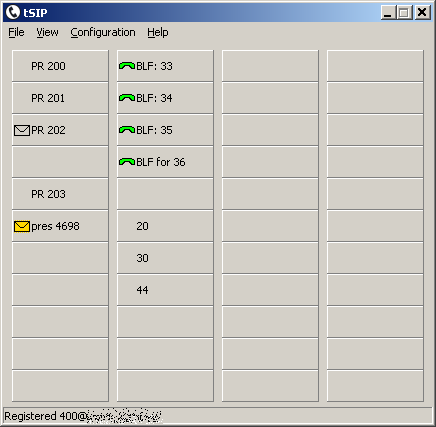 tSIP in console-only mode is intended to be companion for basic desk VoIP phone, although it can be used with analog or system phone connencted to same PABX. While its use is mostly limited to reading extension status, with customized PABX dialplan or other tricks some interaction with desk phone may be possible. One way of using this kind of console to originate call would be defining speed dial button calling desk phone and using numbers with call transfer code prefix on other buttons. 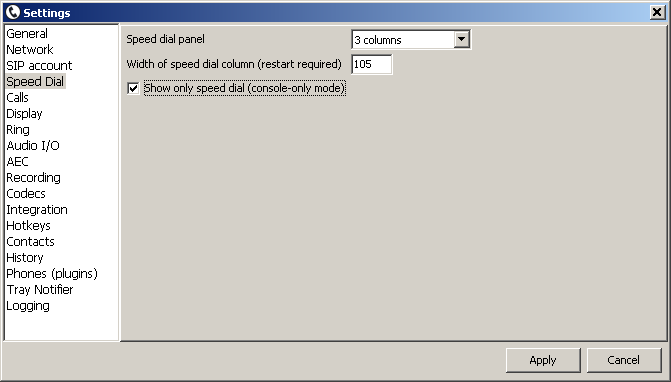 As tSIP main window is scalable, console column width and button heights can be adjusted and default small images can be replaced with bigger (i.e. making whole button background that changes depending on BLF state) interesting use case for console mode is big busy display running on dedicated PC with big screen, visible in whole room.